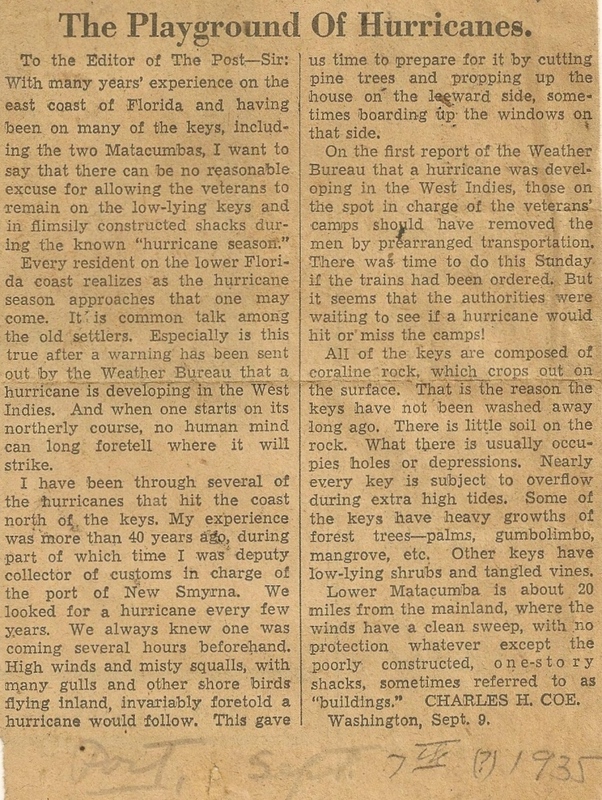 A newspaper article by Captain Charles Henry Coe (1856-1954) regarding veterans in Florida Keys during the hurricane season. In the article, Capt. Coe argues that there is "no reasonable excuse for allowing the veterans to remain on low-lying keys in flimsily constructed shacks" during the hurricane season. Coe also criticizes the authorities in charge of the veterans' camps for not evacuating its residents by prearranged transportation. Original newspaper article: Coe, Charles Henry. "The Playground of Hurricanes." 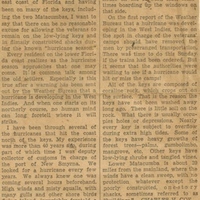 The Palm Beach Post: Private Collection of Andrew M. Foster. Digital reproduction of original newspaper article: Coe, Charles Henry. "The Playground of Hurricanes." The Palm Beach Post. Captain Charles Henry Coe Collection, RICHES of Central Florida. Originally created by Charles Henry Coe and published by The Palm Beach Post. Copyright to this resource is held by The Palm Beach Post and is provided here by RICHES of Central Florida for educational purposes only. Foster, Andrew M. "Captain Charles Henry Coe." History: Town of Jupiter, August 7, 2013. http://www.jupiter.fl.us/DocumentCenter/View/4060. "Capt. Charles Henry Coe.." Capt. Charles H. Coe. http://emeraldmeinders.wix.com/capt-charles-h-Coe?fb_ref=Default. Coe, Charles Henry. “The Playground of Hurricanes.” RICHES of Central Florida accessed April 24, 2019, https://richesmi.cah.ucf.edu/omeka/items/show/6197.